Last night we had arroz con pollo (Spanish rice and chicken) for dinner. It was the final dinner in a week of delicious dinners with our most beautiful friends, Morag and Louisa and Huon, who had been camping on our land. Arroz con pollo. Check out that super-long drumstick! And that little hand, belonging to a certain small person who was very eager to get a taste of "the big one". The night before last night, Morag and I killed and prepared the rooster we used in the dinner. He'd just started to crow, so we knew it was time to eat him. I've killed a few chickens before, but killing animals definitely doesn't come naturally to me. As a child, I spent my school holidays on my Oma and Opa's farm, and I knew they killed and prepared their own beef and pigs - I remember the very well stocked deep freeze, and have a vague recollection of a cow hanging in a tree, thought I don't know if this is real or imagined. On the other side of the coin though, my mum volunteered for Animal Welfare, and my Nana can't even watch an animal documentary in case she sees a lion killing and eating a zebra. Pearl and I have both, at times, been vegetarian and vegan. In recent times, though, we've come to the conclusion that it's not humans eating meat per se that is the problem: it's the way our meat is 'produced', and the amount of meat we eat on account of the fact that we're totally divorced from the effort it takes to kill something and then prepare it for consumption. For the last few years we've become increasingly dedicated to finding ethical and sustainable (or even regenerative) sources of our food - meat and veg alike. For the most part this involves buying local and/or organic, buying direct from the producer, when we can, and growing as much of our own food as possible. We also don't eat a lot of meat. Maybe once a fortnight, and part of our holistic goal for living on/from the land is that we'll eventually produce all our own meat - grown, killed and processed right here. 1. It wasn't the best thing I've ever done. As I said - killing don't come natural to me - but I'm aware of the purely cultural relationship we have with life and the lives of the animals we live with, and I'm really up for challenging myself on this front. I'm also painfully aware of the disgustingly alienated relationship most people have with their 'meat'. It's too easy for us to ignore the life (the quality of their lived experience, and the events surrounding their death) of the animal when we're in the supermarket or butcher shop, and I know that if I am to eat meat, I need to reconnect with the lives and deaths of the animals I'm consuming. 2. In spite of all tis intellectualising and philosophising, immediately after killing the chook, Morag and I both thought we should probably become vegetarians. 3. Gutting the chook was very interesting, but we felt ashamed that we were so unaware of what all the 'bits' were. We've resolved to buy a book on it, so we can, in future, make better use of the whole animal. 4. That said, we did use the feet and unidentified giblets for stock. It was, without a doubt, the most insanely rich and fragrant stock I've ever experienced, albeit a little funny-lookin' to the uninitiated. 5. We need to get our knives sharpened. 6. I'm definitely not looking forward to the next time I kill one of our chooks, but I also know that the next time I eat a chook, I want it to be one we've raised ourselves. While the experience of killing/gutting/plucking etc is not awesome, the knowledge that we're following our ethics and taking responsibility for our food is. Last night's dinner solidified for me that this is what we need to be doing more of. I can guarantee most people would eat less meat if they were involved in the killing and preparation. 7. The last time I knocked off a chicken, I used an axe. But after having some discussions with various people who regularly kill animals of all kinds, I decided to give the broken neck approach a go. It's a little... intimate... and I think I'll be opting for the axe next time. 9. I don't know how I'd go killing a duck ( or any other animal, for that matter). They're very charming. I suppose chooks are charming too, in their own way, and I did have a hard time looking that rooster in the eye on the days leading up to his marriage with the rice, but ducks are something else. Why are some lives more 'valuable' than others? How are we taught to 'know' the value of one animal over another? 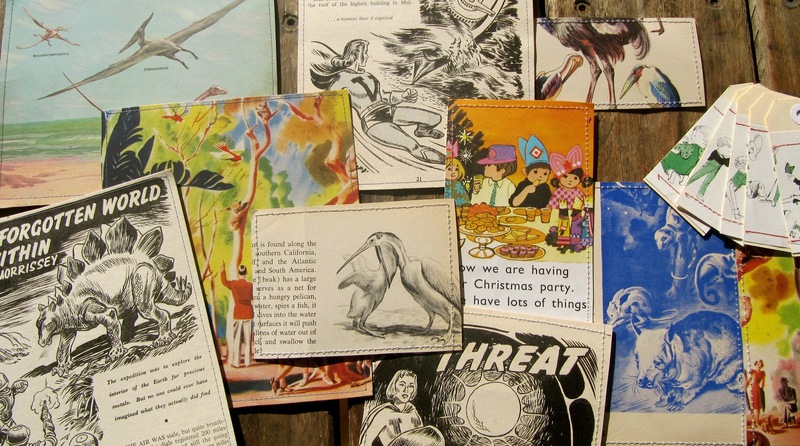 How much does anthropomorphism come into it? 10. The shape of a home-grown chook is pretty different to a shop-bought chook, who are often bred to be so lethargic they don't even move. They're also usually caged so that they couldn't move, even if they wanted to. Ours, on the other hand, had some pretty long drumsticks! We're thinking we'll probably invest in some chickens of a more meat-oriented breed, and maybe do a little pre-kill fattening next time. Chicken-bits in the pan. The smell, at this stage, was something other-worldly, I assure you. 11. The taste? Super tasty! A few years ago my dad had an organic banana for the first time. For weeks afterwards he was telling anyone who'd listen that it tasted like "banana with banana essence poured on it". That was exactly what the chook was like. The whole dish - made with the chook, his giblets and feet, and all organic and/or home-grown veg - was goodness in a paella pan. We felt nourished to the max. One of the awesome things about living in a rural area is the community's willingness to share the abundance from their gardens. Often at work emails come round offering "free raspberry canes at the back door", "lemons and limes in the kitchen" or, most recently, "peaches in customer service". The peaches came from a lovely young chap who recently purchased a property containing several very old and very laden peach trees. He doesn't know what to do with them all, so we scored 3 bags full, in exchange for a selection of our preserves. Yeah! They're super sweet and delicious white and yellow peaches, which are surprisingly juicy given the dry season we're having. The squishy ones we made into peach and vanilla jam, using our awesome new half-pint milk dipper (Christmas present from my Nana and Parps) for ladling into the jars - perfect! The firmer ones we preserved in a light sugar syrup in Vacola jars, using the boiling water bath to seal them. This is a really easy method, which gives a stunning-looking, delicious store of peaches for use in trifles and desserts over the cooler months. Peaches were pitted and sliced, then packed into the jars, and a light sugar syrup (we got t he recipe from Stephanie Alexander: 2 parts water to 1 part sugar) is poured in over the top, the jars are sealed with rings and clips, then the whole shebang boiled in the vacola unit for around 25 minutes. The kasundi is delicious. I want to eat it with every meal, and I very frequently do. But I also like to share it with people, so was very happy to include it, along with some jam and a skirt and some hand-made cards and a cute little t-shirt for my very old friend Meg, who happily ordered a package 4 in support of our pump-buying endeavours. I have known Meg for many many years. We used to hang out when I was 'Annie the tattooed nanny' for a couple of super-sweet little girls. Her girls were the same age, so we'd spend our days going to the park, hanging out at play groups, and eating sushi in the shopping centre. She supported some of my earliest commercial sewing ventures, and she cooked for our wedding and, even though I haven't seen her in years, and her kids are now teenagers (! ), she reads our blog. I was really touched when she got in contact asking for some clothes, and had fun sewing for her again, after all these years. 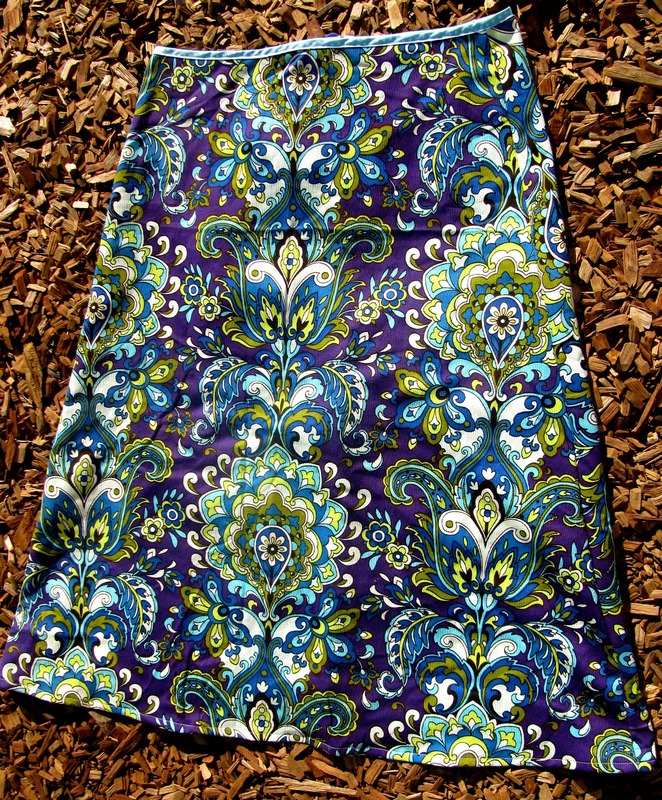 Meg decided to swap her package 4 bolero for a tshirt, which was fine by me because it gave me an excuse to use some of this gorgeous babushka fabric, sent to me by another gorgeous old friend who also supported our pump sale. Rochelle was the happy recipient of this wrap-n-go. I was a bit keen on it myself... but I know she'll love it, and wear it with style, coz she's a stylish kinda lady. The pump itself is now happily installed on our lower dam's wall, and after a number of false starts and some consultation with Brett, and a visit from Baz, local purveyor of pumps, is moving the water where we need it. It's a pretty ace bit of infrastructure, and has definitely been reassuring and helpful during these exceedingly dry, fire-prone times we're having around these parts. Last week Olive stayed up after Oski went to sleep, to do a little photography, her new favourite hobby, which we are completely in favour of. The series was called "Things That Are Special About Our House" and included this great photo of the stairs leading up to our loft. When we were building, we had a vision of a gorgeous, handmade, recycled hardwood ladder, kind of like a ship's ladder. But then time and money got away from us, and several months after we moved in, we still only had a crappy, and pretty ugly, aluminium ladder. What to do when something that is absolutely necessary to your daily life is pretty bloody ugly and definitely not blending with the rest of your interior decor (which in our case jut means crazy amounts of colour and soft furnishings)? Wrap it in a blanket, of course! I've always been very in favour of yarn bombing, but had never actually tried it myself: I can't knit very well or very quickly, and any blankets that come home from the op-shop are too beautiful to chop up and wrap around a tree. But then our new friend Vanessa showed me this awesome video, Keeping the Chairs Warm, and I got completely inspired to give it a burl. The hunt for scarves and blankets began, and before long I had some to go on with. It's super easy to do, obviously, and very satisfying, in that it's pretty quick and totally transformative, and the ladder, thanks to the blankets and scarves, now 'matches' our decor perfectly! Another item that needed a little bit of work at our place was our light shade. 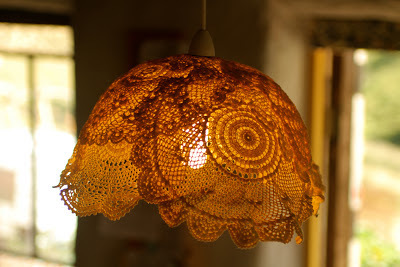 I've re-covered lamp shades from the op shop before, but this time I wanted to have a go at making one out of doilies, like this. 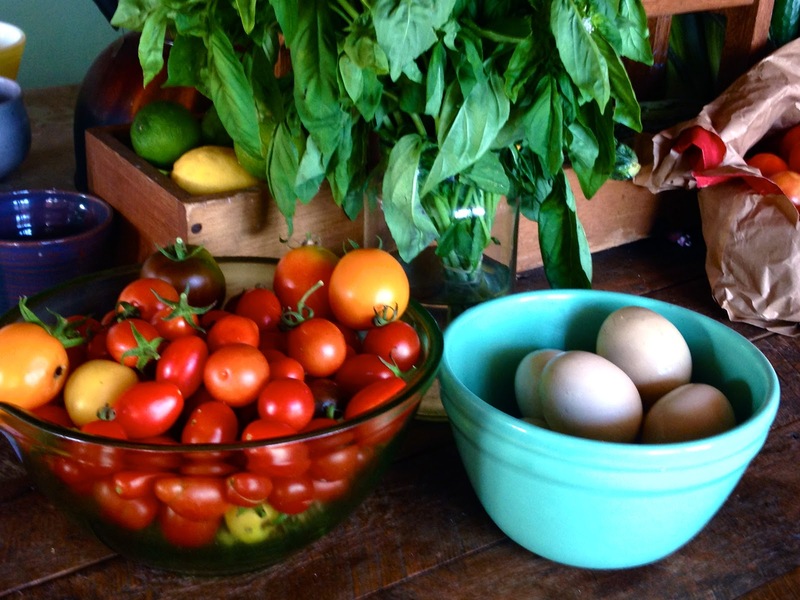 A perfect summertime garden abundance user-upperer, consisting of green eggs and cherry tomatoes with basil. Here's how. Halve your cherry tomatoes, and toss with some chopped basil, salt and olive oil (not too much!). In another bowl, crack your eggs (we usually do 2 for each person). 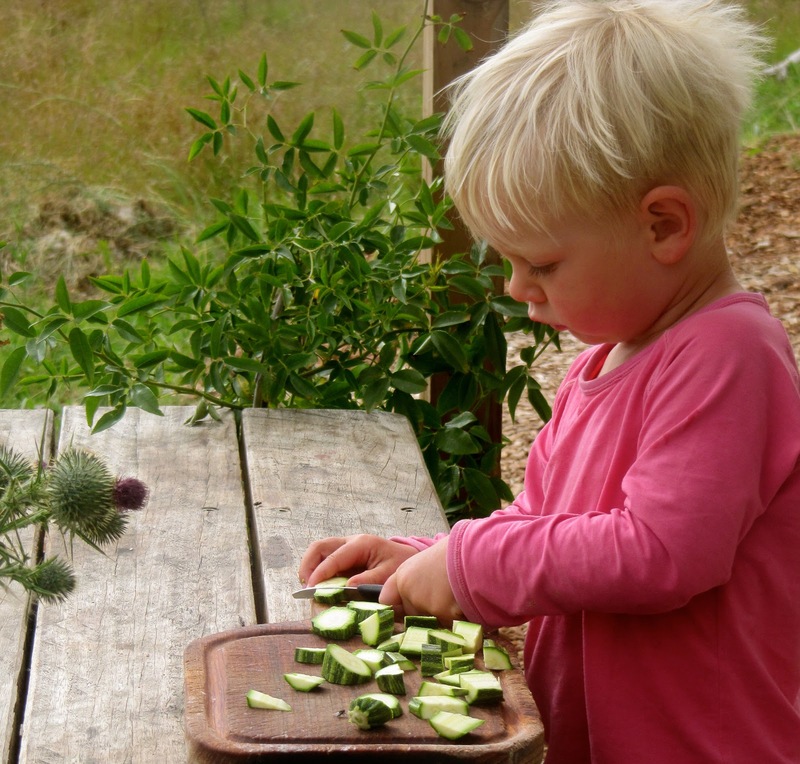 Then go for a stroll around your garden to see what greens you can gather. If you don't have a veggie patch, walk down the street and see if you kind find some weeds! 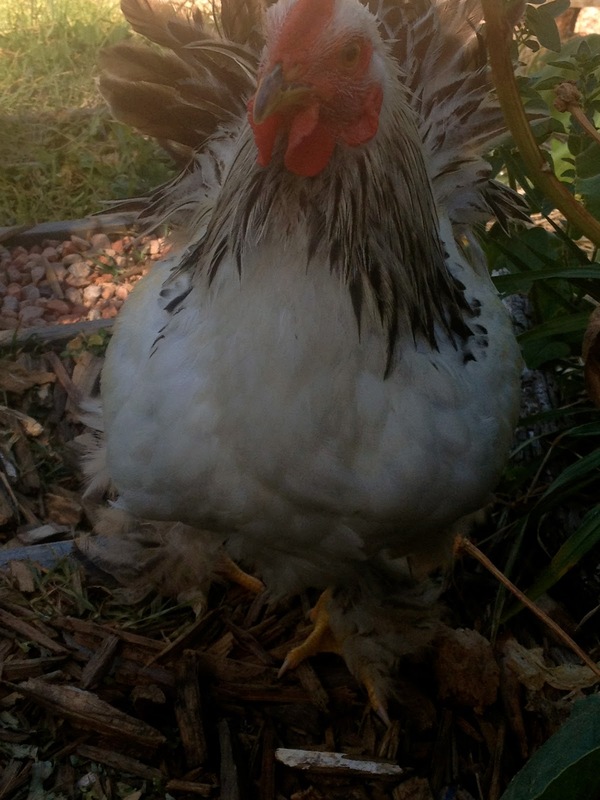 We used fat hen (our new, daily multivitamin), garlic chives, shallots, and parsley. I've always had a bit of a thing for lofts and attics. As a child (and teenager, and adult) I was a little besotted by the idea of a cozy roof-space bedroom, with a sloped ceiling, and maybe a dormer window or 2. I love Laura's descriptions of playing with Mary in the loft above their Little House, amongst the pumpkins and onions they have grown and stored up for the long (and quite probably hideous) winters out on the prairie. When we moved into our own little house, we all immediately fell in love with our sleeping loft. It was cozy, it was warm, it had an amazing view down the valley, and it made us feel so safe. At the time, we could only source enough floorboards for the loft to go half-way down the length of the building. It was therefore just a sleeping loft, with no room for anything other than a big bed and a couple of boxes for keeping books in and on. We were always open to the possibility of extending, but we had to find the timber. We knew this would be tricky, so we were willing to wait. Thanks to my friend and fellow recycled-hardwood-enthusiast David, however, the wait wasn't really that long. I'm not normally a jealous person, but when I visited David's stockpile of recycled hardwood of all shapes, sizes and dimensions, I went a little green, for sure. But he's a totally ace sharer, so we were in luck. His stockpile included a bunch of floorboards that, miraculously, matched the dimensions of the floorboards we already had and so the loft was extended, just in time to accommodate some of the kids' Christmas presents. Decorating and arranging the loft has pretty much been a dream come true for me. It's basically doubled the floor-space of our house, though adults can't stand up there, so it's decidedly kid-friendly space, which I think makes it all the more wonderful for our little people and their friends. Thing was, the floor was kind of hard, and, owing to my less-than-precise carpentry skills, there were some decent cracks between some of the boards, so we'd occasionally get a piece of lego falling through. Enter the mattress felt rug. A couple of months ago when we were working on our spring and summer planting, the kids and I stripped an old double mattress so we could use the springs as a trellis for growing beans. If you've never seen one before, you wouldn't know how beautiful the inside of a mattress could be, all rusted and spiraling and covered in twining bean plants covered in gorgeous scarlet flowers. Better yet, they're free and make use of something that would otherwise be a massive waste issue. The stripping itself is not the easiest job in the world, but it's kind of strangely rewarding. Run a stanley knife around the outside edge and peel back the layers to reveal your beautiful, sculptural spring trellis. If you're lucky, and you have a super-old mattress, you'll find horse-hair or coconut fibre, which can be composted or used as mulch in your garden. And if you have a medium-aged mattress like ours (maybe 20-25 years old) you'll find some felt that you can use to make an excellent floor rug. As you probably know, rugs are a. expensive and b. usually made by poor people who don't really get paid a fair amount for the time and effort they put into the rug-making. For these reasons, making rugs is a pretty attractive idea, except that they take a bloody long time. Mattress-felt rug, on the other hand, took me about 3 hours, including the time it took me to strip it from the mattress. 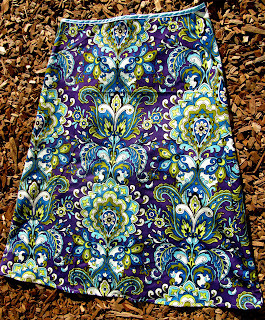 The rest of the time was spent making a border from scraps of fabric (the more colourful the better!) and sewing it around the edge, trying to coax my sewing machine into not freaking out about the thickness of the thing. I arranged it as the kids slept last night, and when Olive woke up this morning, the first thing she said was "where did that carpet come from?" then, "can I go and feel it?". It feels beautiful and, even better than feeling and looking cool, I'm pretty sure it's double-recycled: the felt itself seems to be made from fabric scraps, which means it's got these gorgeous speckles of different colours, including something that looks a lot like yellow lurex. If you can use a stanley knife and sew a straight line, then you can have a freakin' gorgeous bean trellis that doubles as garden feature and windbreak PLUS a floor rug that's free and non-exploitative. How often does something like that happen in your life? A little while before Christmas I was talking with one of our new friends and local bookshop owner (how lucky we are to have a local independent bookshop in this town) about The Weed Forager's Handbook. She had it there in her hand and we had a quick flick through it and boy was I excited. 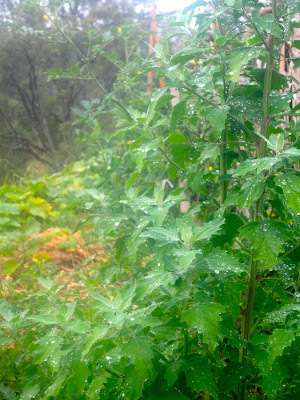 We'd started our weed eating with nettles, not so long ago and of course, blackberries a year ago. Yet we knew there was so much more to learn and explore, so this beautiful little pocket-sized book was just what we craved. Straight away we learned some useful stuff such as, the weedy plant we'd been admiring and picking many many bunches of white Spring flowers is actually the highly poisonous hemlock, killer of Socrates. Holy moley. And the tall not unattractive green bushy plant that had popped up around the place is actually the very edible and very nutritious Fat Hen. Oh yeah! The kids and I had a nibble on some young leaves and we all declared it delicious or in Oscar's case "Ah-licious!". It's nutty and creamy, a little silky in texture and without any hint of bitterness. It's a native of Europe and relative of quinoa and the Mexican vegetable, huazontle. Yeah so it's a totally ah-licious spinach substitute and it's also highly nutritious, containing up to 43% protein and is especially rich in calcium and phosphorous and also containing potassium, magnesium, manganese, zinc, copper, nitrogen and sodium. It has the three main B complex vitamins - thiamin, niacin, riboflavin as well as vitamin A. It has anti-oxidant and anti-bacterial qualities. It is high in oxalic acid so it's best to blanch first and to refrain from going too crazy in quantity consumed in one sitting. This morning we awoke to a cool, misty, rainy day. Utter delight. I could feel the garden heaving a sigh of relief as it sucked in the cool moisture. We huddled inside playing Lego, reading stories, watching Singing In The Rain, listening to the rain running into our tank, eating newly laid ginormous hen eggs and conjuring a dinner that could utilise our garden abundance and our newfound friend, fat hen. I made a tasty, fast cooked sauce of mixed heirloom tomatoes, garlic, chickpeas, basil and fat hen to go with zucchini fritters. Frankly, it was a bloody triumph of profoundly fresh flavoursome flavours. Total joy in the mouth. Next up, we're going to try a creamy, garlicky fat hen pasta sauce. We'll let you know how it goes. Obviously the first 2 options are not so pleasant, but we know we're going to encounter losses of these kinds at some point or another, so we kind of resigned ourselves to the fact that our white ladies may well be gone for good. About 24 hours after first deciding the girls were 'missing', we spotted them, having a peck and scratch around the orchard, like they'd never been gone. This pattern continued. At certain times of the day, they were nowhere to be seen. When I put the chooks to bed at night, the white bantam was not with her flock, and the white duck was nowhere to be found either. But then, at other times, we'd catch a glimpse of them, and figure they were 'back'. What on earth were these girls up to!? At some point, it occurred to me that these ladies might be sitting on clutches of eggs somewhere, so we decided that next time we saw either of them, we'd follow her to try to find out what the heck was going on, private detective style. Yesterday, while I was scything the orchard, I spotted the white lady duck hanging out at the dam with her buddies. I kept scything, so she didn't get suspicious, but watched her closely as she finished up her bath, then promptly slinked under the fence (mental note: spillway makes fence slink-able) and dashed off into the extremely long kangaroo grass we are lucky enough to have a massive swathe of, right next to the orchard. A-ha! When I followed her into the grass, I found her sitting, very protectively, on a beautiful grass nest - complete with feathers. And boy was she pissed I'd found her. She was hissing and getting her shackles up (who knew ducks put their shackles up!!??) and carrying on, so I left her well alone, without even attempting to find out how many eggs she was on. I felt elated and excited for her, and excited for us, too - baby ducklings! And, perhaps even more excitingly, BBQ duck! This gave me confidence that the missing chicken was also sitting on eggs, but no-one had seen her for a few days so we weren't too sure. This morning when Oski and I went for a little morning walk, we spotted something white in the grass, which I initially thought as some wind-blown paper. That was until I remembered the missing white chook. And lo and behold, it was she! Also in a lovely grass nest, but significantly less aggro than the duck. I looked under her and found she was sitting on around 10 little bantam eggs. Go girl! So it seems that, in 2-3 weeks' time or so (ducks and chooks both incubate for 28 days, they've both been 'missing' for 1-2 weeks), we'll be upping the cute-fluffball-baby-poultry ante here on our little farm, and we're pretty excited, not least of all because it means we'll (hopefully) have our first taste of home-grown meat! Escapee baby-flares. They quite like a cuddle. You see, even though we've all become quite fond of our ever-expanding poultry flock (especially the baby bantams, or 'flares', who roam around our house - literally! - eating watermelon and generally cleaning up after the kids) we are pretty mindful of what they're here for. And I think we're all OK with that, though I promise to write a full and very accurate account of our feelings when, in maybe a week's time, we knock off our first rooster in order to make a dish called Arroz con Pollo. At this point I can definitely assure you that my excitement about the dish far outweighs any anxiety I have about the kill. I know it's right. I know it's the way things should be. I know it's how we want to live - connected to our food and where it comes from. I know the rooster's had a pretty awesome life (even if you count his time in the back of a Prius being transported to Bega-town). And I know he probably won't know what hit him. And I also know that when we sit down to dinner that night (my mouth is watering..) we'll feel grateful to him and we'll appreciate that, while it is a delicious chicken dish we're tucking into, someone died for it. Which is something that a supermarket chook makes a bit easy to forget. Like many people at this time of year, we currently have a crazy abundance of tomatoes (all shapes, sizes and colours) and zucchini (big and stripy - not sure of the variety). We also have a well-stocked roadside stall bursting with corn, so Jude Blereau's recipe for Calabacitas (summer harvest stew), with some just-dug, jacket roasted potatoes and Palarang lamb chops, is perfect for us right now. We've been trying to really focus on what we want our long and short term goals to be, so we can refine and have a clear vision of what we want to achieve from our land and living. One thing we're aiming for is to get all our food either from our own hands - grown, raised and killed, harvested, or foraged - or directly from the person who grew/made/raised and killed/harvested the food. Sometimes we feel like this is a ways off, other times, like last night, we're pretty much already there! Zucchini, potatoes, tomatoes and herbs were all from our garden. Corn, leeks and meat were bought directly from the farmer. Yay! Our meal was pretty simple and so so delicious, super-fresh (and therefore healthy!) mostly chemical-free, and supportive of a couple of local farmers in that what we paid them for their produce is their price, not a wholesale price set by a big business or supermarket. We're probably having these kinds of meals several times a month, and it gives us a thrill to literally taste our food-eating goals, and to know that what we're eating is supportive of our local farmers, because so much food is just plain exploitative - of growers and workers and the earth. So here, without further ado (or ranting) is Jude's recipe for Calabacitas. Give it a go! I'm sure if you have a veggie garden you'll at least have some zucchini, and hopefully some tomatoes too. And if you have a local grower's market, you can get some farmer-direct (and hopefully local) corn, potatoes, and maybe even some meat, if you're that way inclined. Enjoy! Calabacitas on the way to the table. 4-5 basil leaves, finely chopped. Using a sharp knife, cut the kernels from the corn cob and place in a bowl. Run the blunt side of the knife along the cob to remove any remaining milk and germ, and add to the kernels. Jude says to peel your tomatoes, but ours were mostly cherries so we just chopped them in half and chucked them in. Heat butter in a big frying pan or skillet over medium-high heat. When the butter is hot, add the zucchini and cook for 2 mins, or until lightly browned underneath - it's important this happens fairly quickly so the zucchini doesn't stew. Turn and brown on the other side for 1 minute. Stir in the corn and add some sea salt and freshly ground black pepper to taste - smell that corn! Reduce the heat to medium and cook for 2 minutes, then stir in the tomato and herbs. Cook for 5 minutes or until the corn is tender. Then serve it up and taste that yummy! Olive has been urging us to have a 'grand opening' of our little strawbale for some time now. We thought for a while it might be October, but couldn't get it together. November was too busy, and December just didn't happen. But New Year's eve, now that was a contender. And so it was decided - our little home would be very grandly opened to our new friends in the Bega Valley (and a few VIPs from Sydney-town and Melbourne who just happened to be down the coast that day) on the final day of 2012, the biggest, craziest and possibly the most fulfilling year of our lives. A fairly decent view of some of the things we've made this year: a home, a fruitful garden, a cubby, and an outdoor loungeroom complete with fireplace and brand new gozleme-rolling table. As Pearl says: "No wonder we're tired..."
It was beautiful. Pearl, as always, put on an abundant, delicious, and delightfully local spread, supplemented by contributions from guests (vine leaf rolls made from the grape vines down the road!!) and crowned by an outrageously enormous and delicious pavlova courtesy of the lovely Robyn. We drank home-brewed ginger beer and chatted and gave people who'd never visited a tour of our place, feeling quite proud and happy all the while. 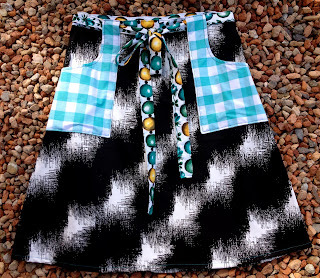 And Pearl, the consummate hostess with the mostess, debuted her new christmas frock and her fireside-gozleme-rolling-table, which was my christmas gift to her. I made the table (using a couple of poles brought down by my Nana and Parps, some branches, the obligatory fence palings and a bit of marine ply leftover from the lintels in our house) so that rolling out gozleme doesn't have to be an inside-the-house job, so that when people are visiting and hanging out by the fire she can roll and chat, so she can look at the view while she works her magic, and so we don't have to carry the made-up gozleme all the way from the house down to the fire. I think she liked it. The kids ran wild in the night, wielding glow-sticks and torches and candles and makeshift jar-lanterns, and the adults drank and laughed and made new friends. 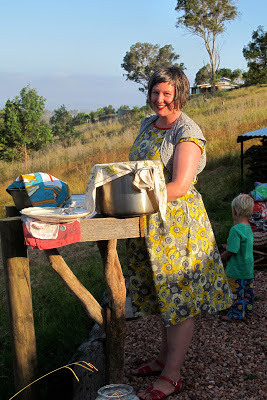 And then we all feasted on Robyn's delicious pavlova, which we'd smothered in plums. Ahhh... plums. We must've eaten hundreds this summer, and I'm happy to say that they have very quickly come to occupy a place in my mind and heart as the motif of our summer eating. And I hope this will be the case for ever more. We eat them at the beach and in the car and at work and after dinner. We eat them stewed on our pikelets and french toast and fresh on our muesli. We eat them straight from the tree by the handful, and give them away by the bagful to anyone who shows even a vague interest in stone fruit. Delightfully, we've discovered even more trees along our road - some enormous and ancient and some newer and smaller - prompting us to wonder about the provenance of such groves. As far as we can see, there are 4 quite different varieties - the original sunset-coloured ones, from the biggest tree of all, some tiny black ones which are almost like a cherry, a larger purple one, and a beautiful, soft, and incredibly sweet orangey-yellow one that I'm pretty sure is a plumcot. Yay! 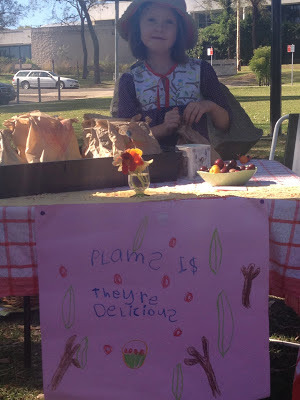 Olive has been so inspired by the abundance that she set up her own little stall at the markets today, selling decorated bags of plums for a dollar per bag. Last night, as she carefully and very diligently prepared her signs and bags, picked and packed her produce, and selected the perfect tablecloth and tasting bowl, we saw a side of her we've never seen before. And we loved it! 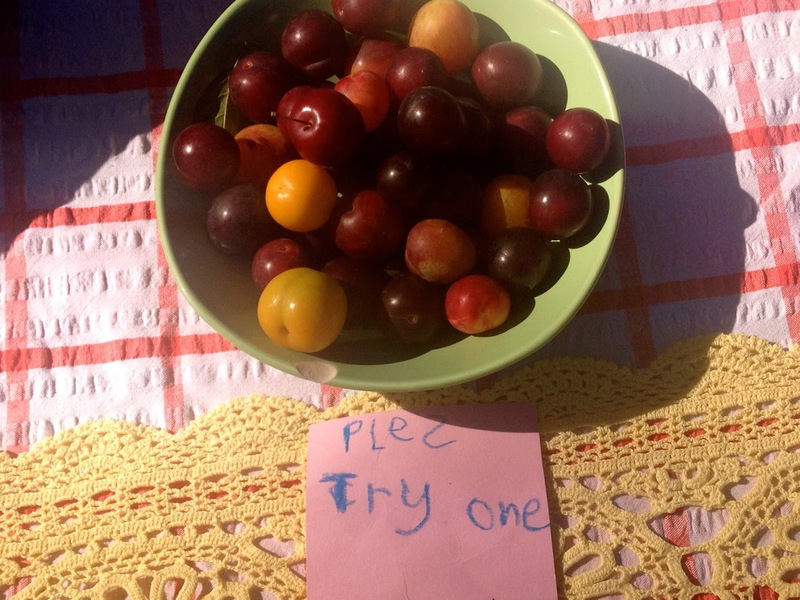 Today, she sat at her stall in the 40 degree heat happily (but somewhat quietly and shyly) chatting to her customers about her plums from the tree down the road, and explaining to people that they really didn't need to ask her the price of the plums because it was written quite clearly on her sign. We were so pleased with our little farmer - her love for the food, her pride in her effort, and her divine signs and table-arranging. And we were happy to be here, in this wilting heat, with our newly (and very grandly) opened home keeping us cool and sheltered from the hot winds that are apparently bringing in 2013. I wonder what's in store for us. One thing we hope is that it's at least slightly less hectic than last year, but hopefully full of just as many pleasant surprises.